Tempered glass is a type of glass that is highly resistant to thermal stresses while being stronger and more impact-resistant than ordinary glass. Tempered glass is ordinary (annealed) glass that has been heated to near its softening point and then forcibly cooled. It is also called heat-treated for this reason. There are two basic types of tempered glass: heat-strengthened and fully tempered. Fully tempered glass is required under federal specifications to have a surface compression of 10,000 psi or more. Heat-strengthened glass requirements are much less, with a surface compression from 3,500 to 10,000 psi. Heat-strengthened glass whose compression is near 3,500 psi will have fracture characteristics much like ordinary glass, while higher psi versions will shatter more like fully tempered glass. Tempered glass cannot be cut (it will shatter). Glass is generally cut and drilled to exact specifications prior to going through the tempering process. 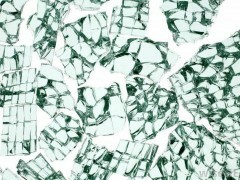 Tempered glass dices, or crumbles, when it breaks. This means it breaks down into small pieces with no jagged or sharp edges, reducing the risk of injuries, which is why it is one of the types of safety glass. It is used in applications where a human might reasonably impact glass and where extra strength of the glass is essential. Tempered glass is valued for its strength and resistance to breakage. Tempered glass is less sensitive to temperature differences than ordinary glass is, and will take longer to crack. An object impacting ordinary glass would need to travel twice as fast to break tempered glass. A wind that would break ordinary glass would need to be up to four times stronger to break the same size tempered glass in the same application. Tempered glass works well in skylights, in doors, in shower doors, as portions of railings, in low-mounted windows, in high-wind areas, in refrigerators, in ovens, on fire screens and anywhere a safety glass of this type is necessary. It is also used in many automotive windows (not the windshield). Newer applications of tempered glass include pot lids, tables, countertops and cutting boards. The International Window Cleaning Association notes that some tempered windows are subject to scratches from microscopic debris and imperfections left in the glass during the manufacturing process when these windows are being cleaned using standard commercial window cleaning techniques and equipment.